This is what you get years after you’ve cut down the remnants of an apple tree and let saplings grow from the roots to become kind of a big apple bush. The tree in question stood in a west Albany yard. It produced tons of pretty good apples, if you disregarded the many wormy ones. One day 10 or 12 years ago a windstorm blew most of it down. The stump was chainsawed at the level of the ground. Not long after, young branches started coming up. They got tall and spread out in a matter of two or three years. There are about a dozen of them now. This is good, because they provide almost as much summertime shade as the apple tree that was there before. This spring, for the first time that I noticed, this whatever it was had quite a few blossoms. They looked like apple blossoms. And sure enough, now there are at least three little fruit, including the two in the photo above. 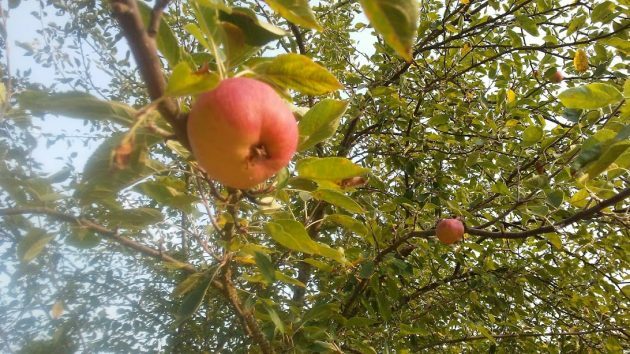 If, like me, you know almost nothing about fruit trees, you try to learn something online. Turns out, according to what I read, that when apple trees are cut off, they will grow againn, But if they are cut below the place where the fruit-bearing part had been grafted on, the new growth will bear, if anything, wild apples. And apparently not many of those.